Osprey adds another title to its highly popular Men-at -Arms Series. This one deals with the Peninsular War, part of the larger Napoleonic Wars 1793-1815.� Their series on the Napoleonic Wars has the largest number of titles published certainly reflecting the continuing popularity of the era. This book concentrates on the British Light Infantry which served in the peninsula. The book follows the usual pattern established for the series, of short text, 35 to 40 black and white illustrations and the centrepiece of eight pages of full-colour uniforms and details on the uniforms illustrated. Mr. Chappell is a former serving soldier of the British Army and brings this background to his book.� Within the space limitations dictated by the series, he gives the history of the development of light infantry in the British Army and does not shy away from pointing out the failure of the British to continue developing this arm which they had perfected in the wars before 1793. He clearly shows that the British early on relied upon foreign troops to provide light infantry to its armies in the field until the British could develop their own. He then goes on to give a brief description of the county regiments which were converted to light infantry [the 71st Highland Light Infantry, he leaves for a future title] and their services. The regiments covered are the 43rd Light Infantry, the 51st Light Infantry, the 52nd Light Infantry, the 68th Light Infantry and the 85th Light Infantry. In the text he has carefully footnoted other Osprey books which give greater details on the earlier and foreign light infantry units. A select bibliography provides titles which the reader can use to follow up on the history of the British Light Infantry Regiments. He has chosen some very nice black and white illustrations to accompany the text, but it is the eight pages of colour uniforms that stand out in the book.� From pre-1803 to 1814, he has given us a very detailed look at not only the British Light Infantry, but of some of the foreign regiments which served as light infantry during the time. There is a good selection of both parade ground look and campaign look to them. This book should satisfy the more serious student, the casual reader and the miniature wargamer. 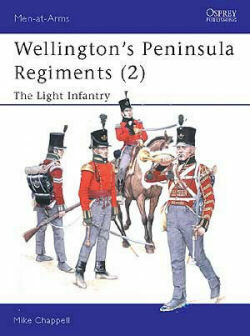 Wellington's Peninsula Regiments is available in bookstores everywhere, through Classic Motorbooks at (800) 826-6600 or at� their website: MBI Publishing.